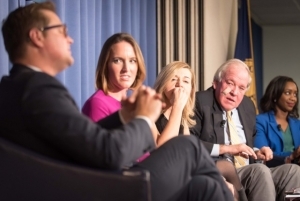 A panel of journalists and political operatives analyzed coverage of the election at a Dec. 1 National Press Club event. (L-R) CNN's Chris Moody, Republican National Committee spokeswoman Lindsay Walters, Washington Post media critic Margaret Sullivan, former White House spokesman Mike McCurry and Washington Post reporter Abby Phillip. Widespread dissatisfaction with the status quo, President-elect Donald Trump’s ability to generate old and new media coverage, limited enthusiasm for the candidates and the Republican Party’s in-depth use of data were the factors that led to Trump’s surprise victory, a panel of journalists and party loyalists said at a Dec. 1 National Press Club event. Democratic presidential campaign staff did not realize they were in trouble in the key state of Michigan until seven days before the election, while Republican campaign operatives began to sense a nationwide victory the weekend before Election Day. “I was surprised…but there wasn’t the shock,” said Chris Moody, CNN Politics Senior Digital correspondent. He attributed his sense for the direction of the election to insight he gained from interviewing many undecided voters during a month-long trip from New York to Las Vegas. He used ranchers along the U.S. Mexican border as an example of Trump voters’ attitude. They had been asking for relief from “hundreds of people coming through their yards for 30 years” with no result so they didn’t care what Trump said or what his attitudes were, just that he might be different. The Republican Party began to understand it could pull off an upset in the presidential race not based on anecdotes but on data. Lindsay Walters, Republican National Committee press secretary, noted that the Committee had spent millions of dollars for in-house data, creating “voter scores,” or profiles incorporating their voting habits, issue important to them, whether repeated door knocks would be necessary to get them to the polls and the likelihood of their voting early. “We knew we were in the margin" and the job became getting "unallocated voters" to the polls, Walters said. As important as data was in the campaign, developments about Hillary Clinton’s email troubles may have mattered more. The revelation that the FBI was reopening its investigation of the former secretary of state’s use of a private email server for some official business changed the tenor of the campaign in its final weeks, according to Abby Phillip, a Washington Post reporter who covered the Clinton campaign. "The email situation was always on a slow burn,” Phillip said. It was now "on the front burner." That development "diminished enthusiasm for the Clinton campaign," said Mike McCurry, White House press secretary during the Bill Clinton administration and co-chair of the Commission on Presidential Debates co-chair Mike McCurry. Clinton was reticent to answer questions about the emails, so reporters kept asking, prolonging the life of the story, Moody said. “She could have put it to bed before the campaign,’ Moody said. Both Clintons think it is self-evident that they act in the best interest of the American people and that "people will understand that. They don't understand perception and the perception of negativity," McCurry said. Ultimately, the email controversy is not what sunk Clinton, according to McCurry. “At the end of the day it was really about who was enthusiastic about their candidate,” McCurry said, adding that Clinton’s “Stronger Together” campaign theme was not compelling enough. Trump was adept at keeping himself in the media by always being available for TV and radio segments. His unfettered access to the voters "was pivotal," Phillip said. Although he wanted to keep himself in the news, Trump had an often testy relationship with the media during the campaign. That’s something that needs to change in the White House, according to one panelist. In addition to parsing the candidates’ media skills, the panel also critiqued how the media covered the race. Margaret Sullivan, The Washington Post media columnist who moderated the debate, asked Moody if there was too much personality and too little discussion of issues. “Policy is often overshadowed by sexiness,” Moody said. “Meeting the people whose lives will change makes you want to cover policy more. Video of the panel discussion, presented by the Club's Broadcast and Podcast Committee, is archived.